There are several cities in North Carolina that report or give access to a complete salary database each year. 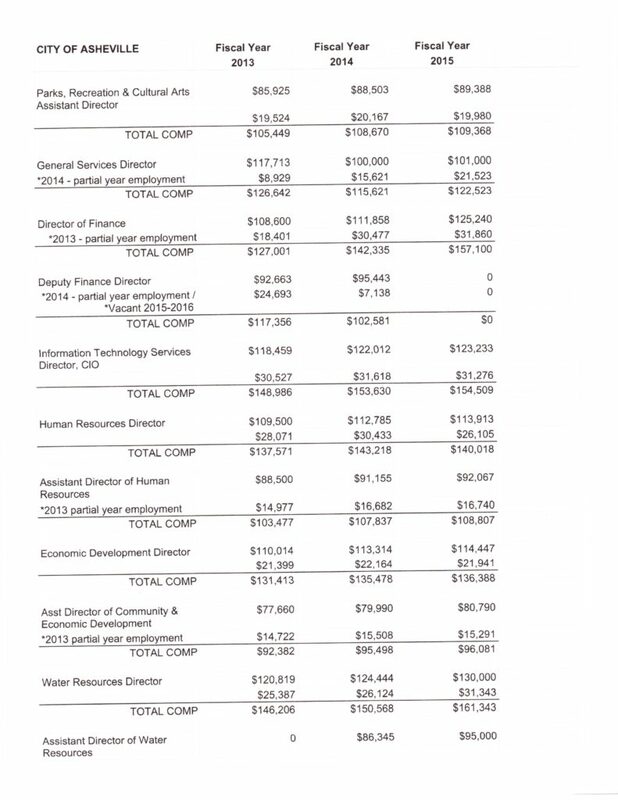 Years ago salary data used to be reported in Asheville. We received this information based on a public records request dated August 1, 2016. It took Asheville until October 3, 2016 to provide the information as well at a cost of $18/hour for staff to put together (update: The City notified us October 10th that they would not charge us after all). We feel this is a service that our City and County should release annually with the budget as other cities do. The County data is available through the UNC School of Government but includes all North Carolina counties. One must review each tab in the spreadsheet to view individual data. 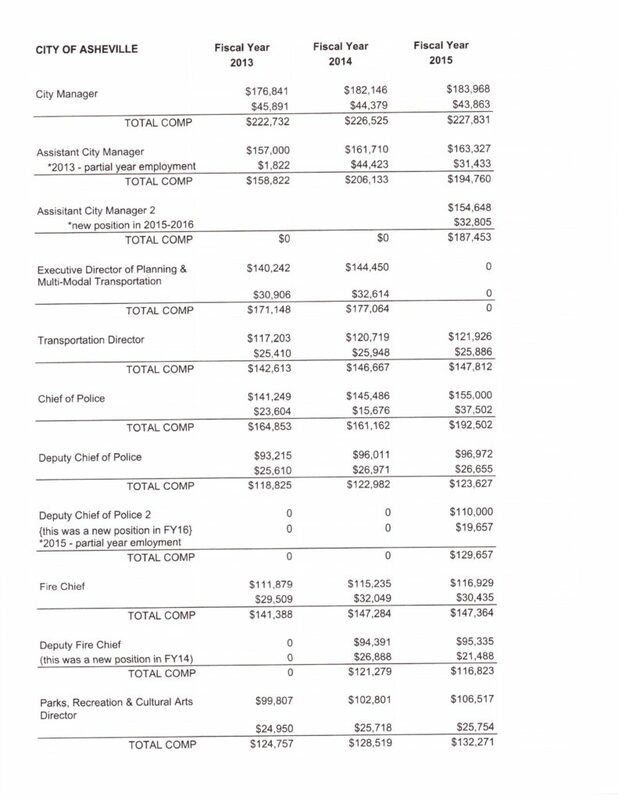 Click on each image below to see Asheville's salaries for the top two positions (or 3 if there is more than one Deputy or Assistant). 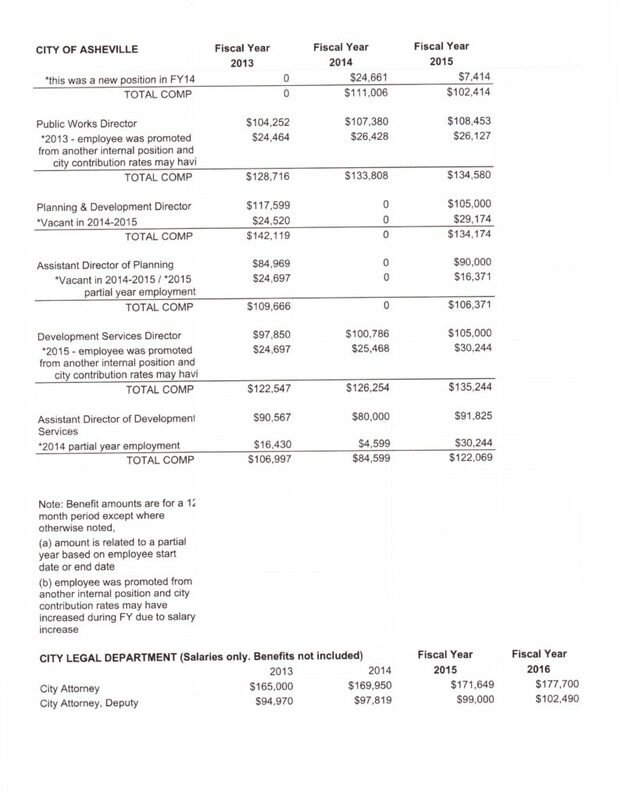 This report is a downloadable file in Excel format containing salary and wage profiles by position that participating counties are offering for the 2015–2016 fiscal year (based on September 1, 2015, salary levels). The job titles that counties used to provide the data are also included. Salary amounts have been rounded to the nearest dollar except for hourly salaries and are expressed in annual amounts unless otherwise noted. download the original file at the UNC School of Government by clicking here. UPDATE: 10.10.2016 We were notified by the City that our response did not "reach their threshold" so they have decided not to bill us for this request.